What type of community do we wish to craft? The question lies at the heart of Welcome Blanket. As a crowd-sourced artistic platform, Welcome Blanket offers a personal—and personalized—opportunity to engage in the politics of immigration. It grows stronger with every participant who joins. By overlapping art, craft, design, architecture, social activism, political resistance, social media, and civic engagement, Welcome Blanketoffers a concrete way to explore abstract ideas. Not only by making the concept of a 2,000-mile border wall tangible through yards of yarn, but also by blurring the spaces between individual stories and collective conversations. 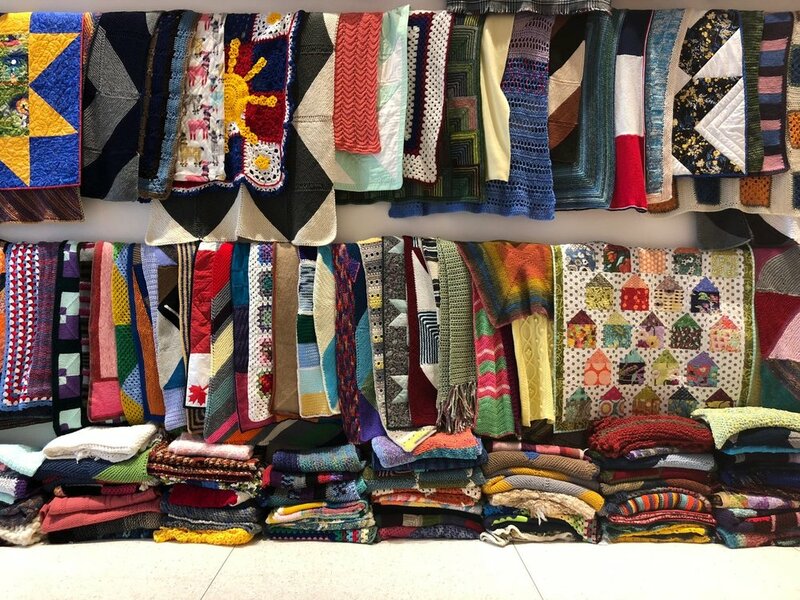 It connects a large-scale installation in a museum gallery with small-scale local craft circles with single links between a blanket maker and a new neighbor. How do we make large-scale civic engagement meaningful, positive, and creative for each individual? How do we intimately understand international crises? How do we share our singular stories in an understandable way? Instead of debate and posts, we should be having conversations about these questions. While knitting, makers think about our new neighbors, immigration policy, and how to create communities of welcome. It is an opportunity to contemplate together in groups or in private moments of reflection. I have two hopes with Welcome Blanket: I hope that whoever enters this gallery experiences the power of craft to transmit crucial, timely ideas. And I hope that our new neighbors who receive these gifts will feel welcomed and reach back to the makers of their blankets. It is our diversity, our multiple perspectives and personal stories that create the fabric of our society.